As you walk around the Aquarium you will hear a myriad of different sounds. Some you expect to hear, like excited children gasping as a shark swims by, or an educator talking to visitors about lobsters. But one sound you probably don't expect to hear at the Aquarium is the braying of a donkey. Does the Aquarium have donkeys? We don't have donkeys. The braying sound you hear is actually coming from our African penguins! Instead of chirping, hooting or screeching; the African penguins have vocalizations that actually sound like a donkey’s bray. Now, the penguin I would like to introduce you to today is Beach Donkey. She has a green and white bracelet on her right wing. She got her name because of the braying sounds of African penguins. When early European fur sealers were rounding the coast of South Africa, they could hear thunderous braying sounds as they approached the coastal islands. When they saw that the sound was coming from strange looking, beach dwelling birds they called them beach donkeys. 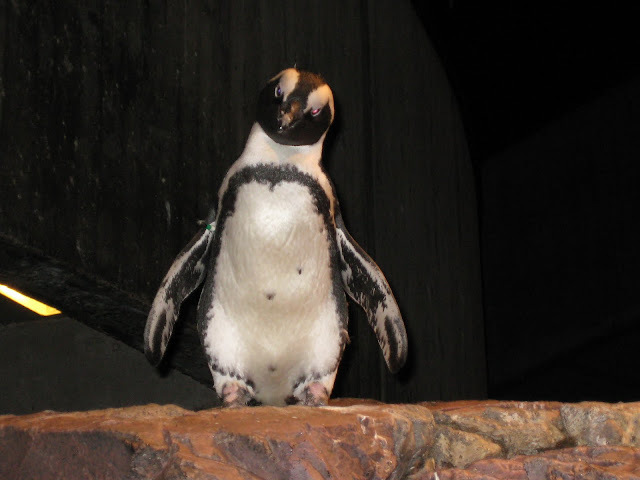 So the next time you are visiting the New England Aquarium try to find Beach Donkey and keep an ear out for our African penguins braying.